Susquehanna Township High School in Harrisburg PA is looking to fill a week 0 open date for the 2020-2021 cycle – 2020 and 21′. We are a 4A School looking for an opponent to do a home and away cycle preferably of 3A or 4A classification. If interested contact Joe Headen jheaden@hannasd.org or Vickie Ivey Vivey@hannasd.org. Milton Hershey School (4A) has the following open date for the 2020 and 2021 football seasons: 2020 – Week 0 August 28 and 2021 – Aug 27. Please contact Athletic Director Mark Rice at ricem@mhs-pa.org. Due to an unexpected cancelation CB South is in need of a Football Scrimmage for this upcoming fall season (2019-2020 season) on Saturday, August 17th 2019. Please contact Athletic Director Chas Cathers ccathers@cbsd.org 267-893-3042) if interested. Twin Valley High School is looking for a week 10 football game next cycle. Line Mountain HS, a small class AA school located in Central, PA is looking for a Week 7 game for the 2020-21 cycle. Looking for class AA school or larger. Please email Head Coach Brandon Carson at bcarson@linemountain.com and Athletic Director Brad Skelton at bskelton@linemountain.com if you have any interest. Penn Wood, a District 1 5A school, has an opening on October 18/19 of 2019 due to a recent cancellation. Looking for a 1-year deal for that date at this time. Can host or travel. Looking for a team with a PA classification of 4A or above. If interested please contact head coach Ato Troop at aktroop25@gmail.com. Pottsgrove High School is currently looking for a football game on 9/13/19 or 9/14/19 (week 3). If interested, please contact Athletic Director Steve Anspach at Sanspach@pgsd.org. Applicants must have or are able to obtain – current Act 34 (PA Criminal Record Check), Act 114 (FBI Clearance) and Act 151 (Child Abuse History Clearance Report) . Resumes may be sent to Steve Anspach Director of Athletics, Pottsgrove High School, 1345 Kauffman Road, Pottstown, PA 19464 or electronically at SANSPACH@PGSD.ORG. Central Dauphin East is looking for game for September 6/7. Was looking for home game but will travel. 6A but borderline 5A. went 3-7 last year. Please contact Head Coach Aaron Blanding at ablanding@cdschools.org. Woodrow Wilson of Camden NJ is a Group 3 school looking for a Football Game (September 6 or 7) and ( September 20 or 21 ). If you are interested please call or Email: whickson@camden.k12.nj.us or (856) 966 5300 ext 34452. School of the Future is looking for a scrimmage in 8/17 and a game on 8/30 night game, or 8/31 day game. If interested, please contact Head Coach Marcus Fulton at futurefirebirdsfootball@gmail.com. Wayne Hills High School in Wayne, NJ is looking for a scrimmage on August 14 or 15. We would prefer to be home. If interested, contact Head Coach Wayne Demikoff at wdemikoff@wayneschools.com. Conrad Weiser is a 4A school in District 3. We are seeking an opponent for Week 7 of our next cycle. Dates are 10/16/20 and 10/15/21. Please contact Athletic Director William Harrison at w_harrison@conradweiser.org. Archbishop Spalding is looking for 2019 opponent on Friday Oct 4th or Saturday, Oct 5th. We are not planning to travel overnight as we already have an out of state trip planned. Spalding is in the MIAA A Conference out of Maryland. We went 7-3 last season. Please contact Head Football Coach Kyle Schmitt at schmittk@spaldinghs.org or (724)-972-1334. Miami Norland High School (FL) is looking to fill open dates: 09/21/2019 and 10/04/2019. Contact Horane Allison at hallison51@dadeschools.net or 305-761-7428. Armstrong High School (5A) has an open date for the weekend of September 13-14 in 2019. We are a rural district located approximately 45 miles north of Pittsburgh. Our team was 5-5 in 2018 and usually carries a roster of approximately 50 kids. Please contact Coach Fabian at ffabian@asd.k12.pa.us with any interest. 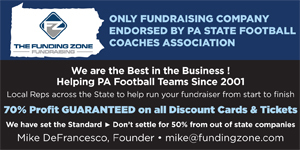 Downingtown East, PIAA District 1, 6A classification, located in Southeastern PA is looking for a Week 0 Football (August 23, 2019) game. We would prefer to host but are willing to travel. Please contact Corey Sigle at csigle@dasd.org if interested. Please contact Athletic Director Bill Hess at bhess@berkscatholic.org. Fleetwood a small 4A school located in District 3 has a week 8 football opening on October 23, 2020 (away) & October 22, 2021 (home). Please contact head football coach Sean Gaul at coachgaul@gmail.com. Coolidge HS in Washington, DC is currently looking for games for 8/30/19 or 10/11/19. We are a small population with about 300 kids school wide and 30 students in the program. Is it possible that we are added to your site. Please contact Coach Cartwright at (202)-247-8972 or by email Taurean.cartwright@gmail.com. Briarcliff HS is looking for a game on November 2, 2019. Briarcliff High School has 417 students and a record of 7-11 the last two years competing in Class B. Can only host. Please contact Head Coach Skip Stevens at skipstevens@netzero.net if interested. NYC PSAL School Truman HS is looking for a game on September 7, 2019. Truman has a record of 8-11 the last two years, and competes in the “City” division of the PSAL. Would like to host but is willing to travel. Please contact Head Coach John Sheppard at Jshep39@hotmail.com if interested. Pope John XXIII (Sparta, NJ) is looking for a scrimmage on (Weds) August 14th, home or we’re willing to travel (up to 3 hours) and participate solo or with other teams (tri/quad). We’re 3A and are the back to back 3A Public League Champions, who normally carry 30-35 players. If interested, please contact Head Coach Marcus Fulton at futurefirebirdsfootball@gmail.com. Lower Moreland is looking for a game on 9/20. Home or Away. We are a 4A school and were 1-6. We typically have 25-30 boys on the team TOTAL. If interested, please contact Head Coach Justin Beck at jbeck@lmtsd.org. Cleveland Saint Ignatius, seeks a varsity football game week 4 (Sept. 20-21) and week 6 (Oct. 4-5) in 2019. If interested, please contact Athletic Director Rory Fitzpatrick (rfitzpatrick@ignatius.edu) or 216-651-2691. James Buchanan High School has several open dates that need to fill. We are a 3A school located in district 3 and we play an independent schedule. We won 4 games last season. We anticipate about 35 kids on our roster in 2019. We are currently looking for a game on October 25/26. Please contact Head Coach David Miller if interested e-mail: milleda@wcps.k12.md.us or AD Larry Strawoet at Larry.Strawoet@tus.k12.pa.us. Haverford High School is looking for a game on week 0, August 23, 2019. If interested, contact Head Football Coach, Joe Gallagher at jgallagher@haverfordsd.net or call 484-802-3529. Nativity BVM is looking for a game on October 25, 2019. Preferably a home game. If interested, contact Athletic Director, Josh Muldowney at jmuldowney@nativitybvm.net or call 570-622-8110. Unionville HS, a 5A school located in Chester County, is looking for a (9/27/2019) football game next year. Please contact Supervisor of Athletics, Pat Crater (pcrater@ucfsd.net), if you’d like to connect. Bristol Borough is looking to fill the dates of: 8/30, 9/6, 9/20, and 10/18. We are a Single “A” with a team between 18-20 players. Our preference would to host but may be able to travel. If interested please call John Greiner at 215-378-2650 or please email at greiner.john@yahoo.com. If interested please contact Head Coach Rich Holzer at rholzer78@icloud.com. The Academy of the New Church has an open date 10/25-10/26/19. We’d prefer to travel in 2019. We’re an independent school with 130 boys. Please contact A.D. Brandon Asplundh at brandon.asplundh@ancss.org if interested. Springfield Township is looking for a week 7 opponent October 11. We are a small 4A school with about 40 players in the entire program. If interested, please contact head coach, Chris Shelly at chris_shelly@sdst.org or 215-495-3596. Wayne Valley HS (NJ) is looking for an opponent for the week of September 6-7, 2019. We are looking to travel out of state if possible. We are a NJ Group 4 school (enrollment approx. 1300 grades 9-12). If interested please contact HC Roger Kotlarz at rkotlarz@wayneschools.com. Penns Grove (NJ) has filled the date we previously contacted you about for 2019. So please edit posting. We are looking for a game on 10/12 or 10/19 weekend. If interested please contact John Emel at john.emel@comcast.net. Old Tappan HS (NJ) will be looking for a game 10/11-10/12. We are willing to travel. If interested please contact Head Football Coach Brian Dunn at dunnb@nvnet.org. West Catholic Preparatory HS is looking for a 2019 Week 0 game for either August 23rd or 24th. Home Game Preferred but will travel. We are open to a 2-year Contract . If interested, email Head Coach Brian Fluck bfluck@westcatholic.org. The Pennington School in Pennington, NJ is a small private school with no postgraduates. We are a small group one school and have about 27 players on our team. We are looking for games for our 2019 season. If interested, email HC Jerry Eure at jeure@pennington.org. The Academy of the New Church has two open dates for the 2019 season: 8/30-8/31 and 11/1-11/2. We’d prefer to travel in 2019. We’re an independent school with 130 boys. Please contact A.D. Brandon Asplundh at brandon.asplundh@ancss.org if interested. Springfield Township Montco is a small 4A school that won six games in 2018. We are looking for competitive games for the following weeks. Interested coaches can contact Chris Shelly at chris_shelly@sdst.org or 215-495-3596. The Haverford School, Haverford, PA is looking for an opponent for the weekend of Sep 27/28. Please contact HC Michael Murphy (mmurphy@haverford.org) if interested. Garnet Valley High School (D1 – 6A) is looking for a game for week 0 (8/23 or 8/24). Please email head football coach, Mike Ricci at riccim@garnetvalley.org if interested! Neumann Goretti 3A school, is looking for games for the 2019 season for the following dates, 8/23-24, 8/30-31 (preferably in Wildwood, NJ on Sat, but flexible) and 9/6-7. If interested contact AD, Chalie Szydlik 215-465-8437 x276 or cszydlik@neumanngorettihs.org. Upper Darby HS has an open date September 13, 2019. If interested please contact Skip Barnes at Hbarnes@upperdarbysd.org. Haverford High School , Havertown, Pa., is looking for a game on September 13, 2019. If interested, contact Head Football Coach , Joe Gallagher at jgallagher@haverfordsd.net. Lower Moreland High School-District ONE 4A (Located in Huntingdon Valley, PA) Is looking for a COMPETITIVE Week 0 Varsity football contest for the upcoming, 2019 season. We compete in a small school conference of mostly 1A-3A schools. Prefer to play home but willing to travel. If interested please contact Our AD at Mheiland@lmtsd.org or Head Coach at Jbeck@lmtsd.org. Pennsbury High School ( District 1, 6A) is looking for a football opponent for 8/30/19. We would like to do a two year deal, and would prefer to play at home in year 1. Bensalem High School is looking for a Week 1 (game 2) game for the weekend of August 30, 2019. Contact Ed Cubbage at ecubbage@bensalemsd.org. Abington High School in the Suburban One League, District 1 PIAA 6A Classification is looking for an week 2 game Friday August 30th 2019. Southern Columbia is looking for a JV Football game for this Monday October 29. If interested please contact Jim Roth at 570-204-7709. Due to unforeseen circumstances St. Mary High School located in Rutherford, NJ needs a game this weekend either 10/19 away or 10/20 away or home. Please contact head coach Mike Coyne at mcoyne51@yahoo.com. Northeast High is looking for a game on 10/26/18 or 10/27/18 home or away. Please contact Coach Troy Gore at onerockonelove@outlook.com if interested. The Hun School of Princeton located in Princeton NJ will be looking for 3 games next year in 2019. 9/14, 9/21 and 9/28. We are willing to travel. If interested please contact Head Football Coach Todd Smith at toddsmith@hunschool.org. Northeast High (6A) is looking for a game this upcoming week Sept 14/15. Please contact Coach Troy Gore at onerockonelove@outlook.com if interested. John Bartram High School now has an open date for the weekend of September 14th. Willing to play home or away. Anyone interested contact Head Coach Jim Chapman at jchapman2@philasd.org. Bristol Borough High School has an abrupt opening for the weekend of 10/19-10/20. We had a scheduled HOME GAME, thus we are looking for a team to play at HOME. We are Single A Team with only 22 players looking to play a comparable team. Please contact John Greiner at 215–378-2650 if interested. Chester High is looking to fill an open date September 7th or 8th. We’d like to be away 2018 and home 2019. We are 6A but really close to 5A (about 45 players). If interested contact Assistant Football Coach James Howard at peach27.jh@gmail.com or 484-995-3206. Wissahickon High School, Ambler, PA (5A) is looking for games (10/19, 10/20) for the next two year cycle. Would prefer to be home in 2018 and away in 2019 for the 10/19-10/20 dates. Quakertown Community High School – a small 6A Bucks County school is looking for a game on 10/26/18 and 10/25/19. We would prefer away in 2018 and home in 2019. Cedar Cliff HS, a 5A team in Camp Hill, PA is seeking games for the 2018 and 2019 school year. Dates needed are 9/7/18 (at Cedar Cliff) and 9/14/18 (Away) with corresponding dates in 2019. Prefer 5A or 6A schools. Will consider a 4A opponent. If interested please contact John Kosydar, Athletic Director, at jkosydar@wssd.k12.pa.us or 717-737-8654. Jim Thorpe Area High School is looking for a football opponent for the 2018 season Sept 14 2018 and Sept 21 2018 and 2019 season Sept 13 2019 and Sept 20 2019. We are a 3A school.